This year I launched as Jude Philip – Independent Specialist Speech & Language Therapist. It’s been a busy 6 months, and a steep learning curve but I’ve loved it. 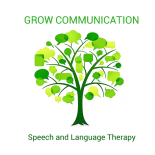 I’ve gathered up some exciting bits of speech and language therapy work with lots of fab families – and had some lovely feedback from satisfied customers. Autism is my area of specialism – from 18 months to adults. Reading, researching, talking about Autism and communication is what I’ve spent an awful lot of time on this year and I can wholeheartedly say that I have loved it. I am often found with my smartphone in hand glancing through articles, interviews and blogs and if you asked my kids to guess what I was looking at they’d be highly likely to say “autism”. I just went and asked them what they think it is I do and both of them said “help people”. I asked them what I help with and they replied “to understand”, “to be less nervous”, “to talk” and “to play”. They’re not far off. 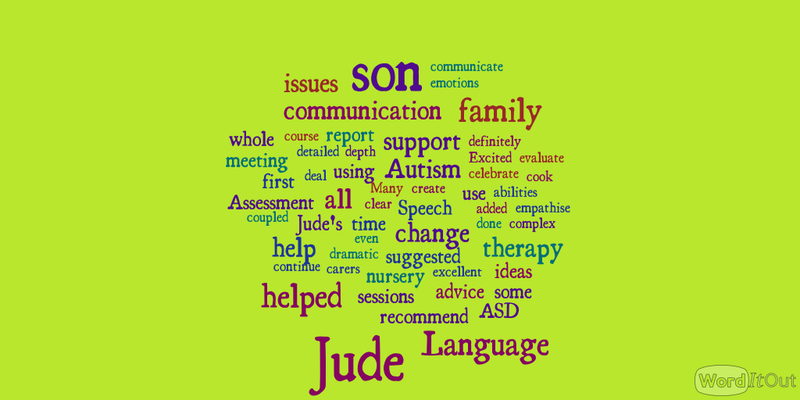 It’s been a while since I last posted a blog – so to get me going again I pushed my testimonials page from www.judephilip.co.uk through a Word Cloud app (Worditout) – and here is the result. A few random ones in there as well – but on the whole it might give you a flavour of what I am all about. This entry was posted on December 27, 2015 by judephilip in Uncategorized.